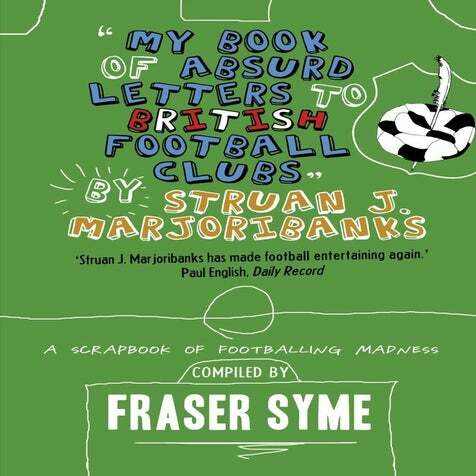 I've written a book of prank letters to football clubs that I'm hoping will be of interest to you. The title of the book is 'My Book of Absurd Letters to British Football Clubs' and £1 of every sale goes to charity - the RRP is only £6.99. The book has received fantastic feedback and support so far and I'm hoping that the Barnet fans will also enjoy the book and help raise money for charity. There are 24 chains of letters in the book involving clubs across Britain including Arsenal, Chelsea, Everton, West Ham, Peterborough, Bradford City, PNE, Barnsley, York City, Lincoln City, Doncaster Rovers, Exeter City, Middlesbrough, Celtic, Hearts, Dumbarton, Dundee etc. The book is supporting 3 amazing charities - one of which is the Adam Stansfield Foundation (an Exeter City player whose spoof portrait I painted for the book - he tragically passed away just 7 months after signing his portrait). When someone buys the book from my site they pick which of the charities they want one pound of their sale to go to. I'm very keen for my book to give people a laugh, but also for it to do some good at the same time by raising money for charity. If you were able to help me achieve that I would be extremely grateful. Hi Guys, I just wanted to post a little reminder about my book of prank letters to football clubs. I've still got a few left and they're a perfect stocking filler or pressie for someone that you actually like this Christmas - plus a pound of their present will go to charity which I'm sure you will agree feels perfectly in the true spirit of Christmas. You can pick up a copy at the link below, and thanks very much to everyone who has supported the book - it is greatly appreciated!